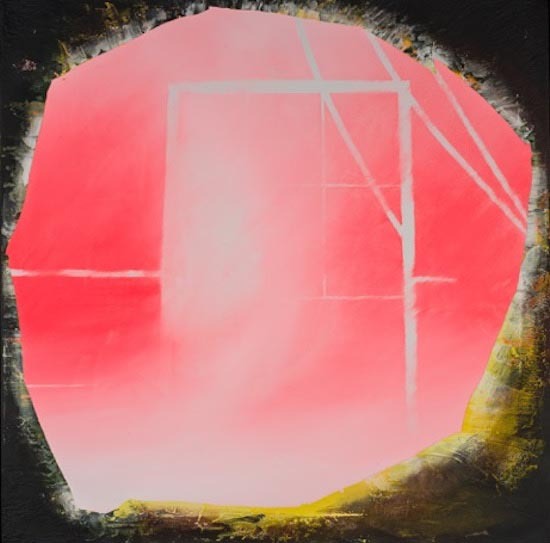 The Cave, acrylic & ceramic tile adhesive on canvas, 2014 by Rush Baker. See Baker’s Under Pressure at Honfleur Gallery Friday Night. Join Washington Project for the Arts as they open two new Hothouse projects. Hothouse Video: Amy Finkelstein and Hothouse: ImPRINT are featured this May. For details, click here. Both openings will be at Capitol Skyline Hotel located at 10 I (Eye) St. SW.
Cove – 7 p.m. to 9 p.m.
Join the Cove community for the opening of Hester Ohbi’s solo exhibition in Capitol Hill. Ohbi’s colorful works are reminiscent of her childhood summers in Pennsylvania. For more information, click here. cove Capitol Hill is located at 611 1/2 Pennsylvania Ave. SE. The Galleries at Takoma Park – 7 p.m. to 9 p.m.
STEAM…when science intersects art features works by Leda Black, Martin Levin, Cleve Overton, and the Bridges Organization. For more information about the exhibition, click here. The Galleries at Takoma Park are located at 7500 Maple Ave, Takoma Park. Honfleur and Vivid Solutions Gallery – 6 p.m. to 8 p.m.
Honfleur Gallery presents Under Pressure, a solo exhibition featuring the work of Rush Baker. Vivid Solutions Gallery presents 3 Millimeters, the work of Greg Kahn. For more details about Rush Baker, click here. For more details about Greg Kahn, click here. Honfleur Gallery is located at 1241 Good Hope Rd. SE. Vivid Solutions Gallery is located at 1231 Good Hope Rd. SE. Jason Wright’s solo exhibition V E R S U S strives to bring life to sometimes overlooked and forgotten places. Wright is inspired by the everyday and encourages views to really examine the areas surrounding them. For details, click here. Long View Gallery is located at 1234 Ninth St. NW. The 2015 Gateway Open Studio Tour Noon to 5 p.m. The 11th annual Gateway Open Studio Tour is the largest visual arts event of the DC region. See well over 100 artists in their native habitat—the studio—and seven art exhibitions. Then join the 39th Street Gallery for an opening reception of Kyujin Lee’s Dreaming Impossible Dreams and after-party featuring Korean food. Full listings and downloadable map here. Open Studio dc – 1 p.m. to 4 p.m.
Join Open Studio dc and the Corcoran College of Art + Design for the opening of Deceptively Obvious. This exhibition features a unique collaboration between screenprinters and poets. For more information, click here. Open Studio dc is located at 1135 Okie St., NE. Interspatial is a group show curated by Quota opening at Transformer. The exhibition challenges viewers to examine multiple interpretations of space through the question “Do we try to fit in or redefine what these spaces are?” For details, click here. Transformer is located at 1404 P St. NW. The Fridge – 6 p.m. 10 p.m.
Join The Fridge for the opening of Apoptosis a sculptural exhibit by Peter Krsko. Krsko’s large-scale sculptures are created through repurposed lumber collected throughout the metro area. For more information, click here.